Dentures, also known as false teeth or plates, are a viable option to consider if you have no or very few natural teeth remaining in your mouth. Denture technology today provides several options enabling you to restore the appearance of your smile, enjoy your favorite foods again, and say yes again to social invitations! Aside from traumatic injury, most often teeth are lost one at a time over the course of several years for a variety of reasons including: gum disease, pulpal tooth decay, or unrestorable broken teeth or fractured teeth. If your missing tooth or teeth are not visible when smiling or in conversation, you may not initially think twice about the lasting impact of a single missing tooth until additional teeth are lost. The extraction of a single tooth will result in a space. Mother Nature does not like a void, if a missing tooth is not replaced promptly, adjacent and opposing teeth will shift, drift, and increases the likelihood that you may lose additional teeth. The continued loss of additional teeth over your lifetime will eventually negatively impact your smile, prematurely age your outward facial appearance, your ability to chew and digest your favorite foods, as well as your ability to speak clearly. Additionally, research has shown that a person who has several missing teeth laugh and smile less and more often decline social invitations due to embarrassment and/or lack of self confidence. Denture technology enables your dentist to replace any missing teeth and restore your smile. Enjoy most of your favorite foods again! Say yes to social invitations! Even with modern and advanced dental technology, replacement teeth will never exactly replicate your natural teeth you were born with. Many of our dental patients are surprised to learn about alternatives exist to having conventional dentures fabricated. Dental implants are a great alternative to consider. function like natural teeth and can eliminate the need for dentures altogether. A dental implant supported partial denture is a viable option if you have remaining natural teeth yet or have an ill fitting existing denture or partial denture. This option includes the strategic placement of dental implants to provide unparalleled retentive support for a partial or conventional denture. Discover what your options are. 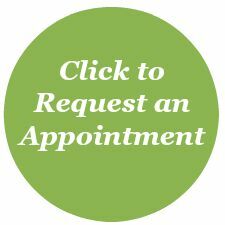 Call (763) 586-9988 or click the green button below to request an appointment online. 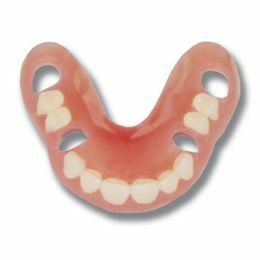 There are several varieties of dentures available. A denture (pictured above) is held in place by the suction seal created by saliva covered gum tissue and the fabricated denture. How well a denture fits depends upon many variables including an individual’s unique anatomy and amount of supporting bone. With proper handling and care, conventional dentures can last several years. Just as the name implies, an immediate denture is fabricated and inserted in a single visit to avoid a “toothless” period. The fit of of an immediate denture will change as the supporting bone ridge heals following tooth extractions. A procedure called a reline will be necessary to improve the fit of the immediate denture long term. 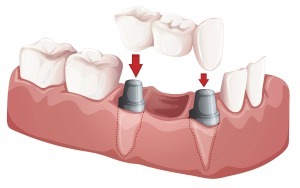 implant supported denture is inserted into the mouth and is securely held in place by copings (support post). A dental implant supported denture not only restores function, they also enable you to enjoy foods you previously had to give up. They require no adhesive, and will not move while eating or speaking. A transitional or partial denture is for an option if you have a combination of missing and natural teeth. 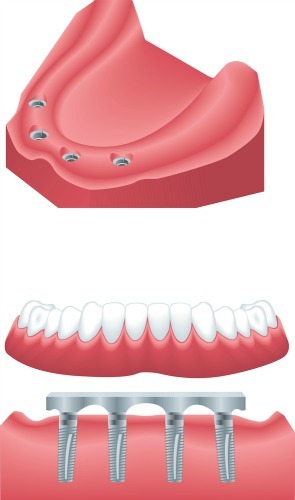 A transitional denture has openings (holes for the natural teeth) that enable the denture to rest on the bony ridge. If any remaining natural teeth require extraction in the future, the natural teeth openings can be replaced with an artificial tooth. 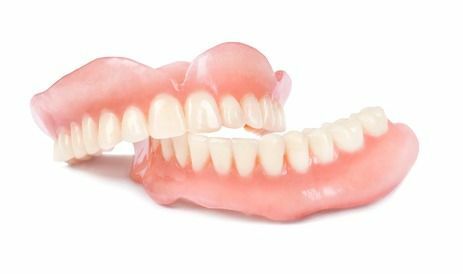 Dentures are fabricated by a certified dental lab technician who specializes in the fabrication of dentures (denturist). Dentures are made of acrylic (plastic) inset with the patient’s choice and shade of either acrylic or porcelain teeth. Interesting fact: Our first president, George Washington is famously known for having had dentures made from wood. Contrary to popular belief, his dentures were not made from wood. Instead teeth were handcrafted from hippopotamus and elephant ivory and held together with gold springs (Source: Wikipedia). of aesthetic characteristics to enable the dental lab technician to fabricate your new denture/s. The denture making process requires a sequential series of appointments as the dental lab technician completes each fabrication step of your new denture/s. These appointments are often called “try in” appointments. The number of appointments necessary varies among individuals. Additionally, after the final denture is fabricated and fitted, there will be additional follow up visits to manage the inevitable “sore spots” that will surface. Sore spots are normal and to be expected. Sore spots result from uneven pressure of the denture and the underlying bone ridge and/or tissue. The dentist will examine your mouth and make necessary adjustments to your denture/s as needed until the fit is perfect and comfortable. Call (763) 586-9988 or click the green button below to request an appointment online . Even if you have no natural teeth and your denture/s fit well, it is important to have them professionally cleaned and inspected by your dentist every 6 months. Overtime, your denture will build up unsightly stain and hard tartar buildup despite meticulous, daily care. ***Do not use over the counter denture cleaner if your denture has gaskets. This will cause your gaskets to dry out, become brittle, and will affect the fit of your denture. 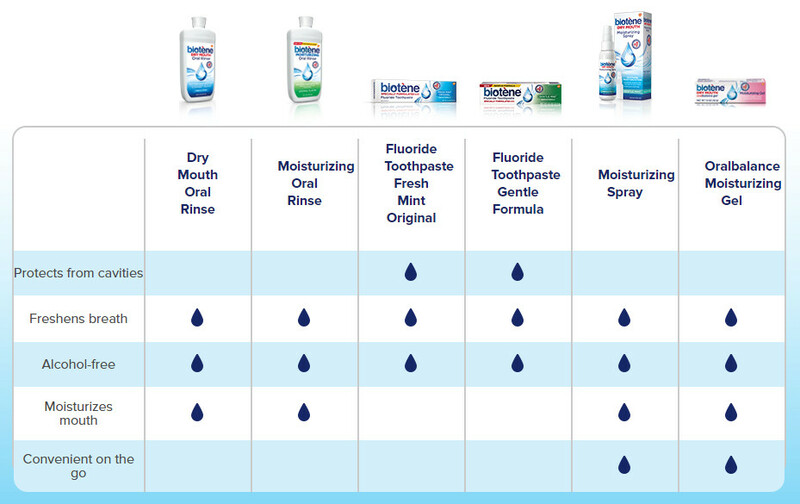 help you manage and relieve the symptoms associated with dry mouth. Smoking and/or use of smokeless tobacco may stain your dentures and overtime permanently alter the brightness of your denture teeth. There are over the counter cleaners to help reduce unsightly stains. Dentures with porcelain teeth resist stain better than dentures fabricated with acrylic teeth. fit as tight as when they were new. A denture reline is a procedure that restores the fit and extends the life of your dentures. Over time, the supporting bone ridge in your mouth changes and gradually cause the fit of your dentures to not fit so well. The dentist will take an impression of both your mouth and of your existing dentures and send these impressions out to our dental lab where a dental lab technician will clean, inspect, and restore your dentures fit as necessary. If scheduled in advance, your denture can be relined in a single day. Call (763) 586-9988 to preschedule a 10 minute early appointment and a 10 minute late afternoon appointment. Doing this will minimize the time you are without your dentures. Most denture repairs can be completed in a single day. Call (763) 586-9988 to schedule a denture repair appointment. Do NOT attempt to repair your denture or partial with an over the counter adhesive like super glue. These products are not safe for use in the mouth. Q. How much are dentures? A. The cost of dentures depends on many factors including type of denture, if there are teeth that need to be extracted, etc. Your dentist will discuss your options and will provide you an estimate of costs for you to make an informed decision. Q. Are dentures covered by my dental insurance? A. Many dental insurance plans provide dental benefits for the fabrication of dentures and partial dentures. Feel free to ask one of our patient care coordinators for assistance. A. Fitted, maintained dentures can last several years. Q. How long does it take from start to finish to have dentures made? A. The process to make a denture involves several steps and is different for each person. Dentistry for the Entire Family offers complimentary consultations for you to meet and discuss your specific situation with a dentist.